BR Class 3 2‑6‑0 No. 77003 out of steam in the yard of its home depot at 55B Stourton on 8th August 1965. Also in the frame is LMS Class 8F 2‑8‑0 No. 48160, again of 55B. No. 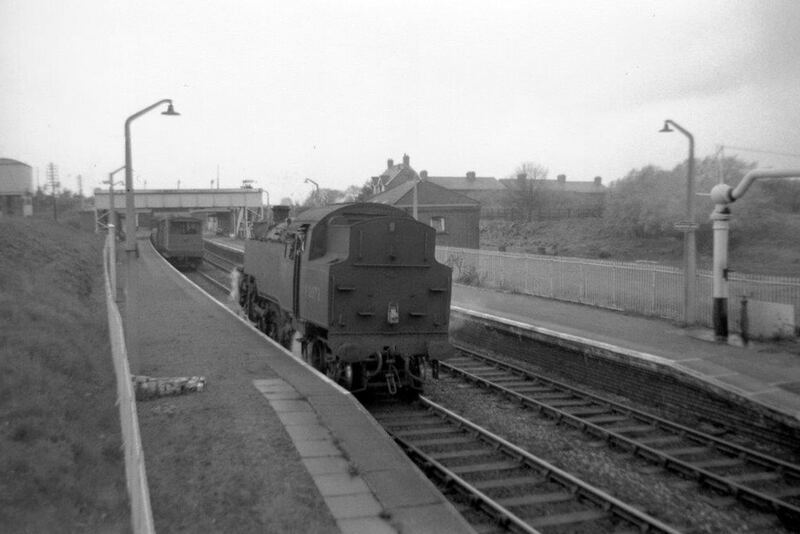 77003 remained at Stourton MPD until withdrawal in December 1966. 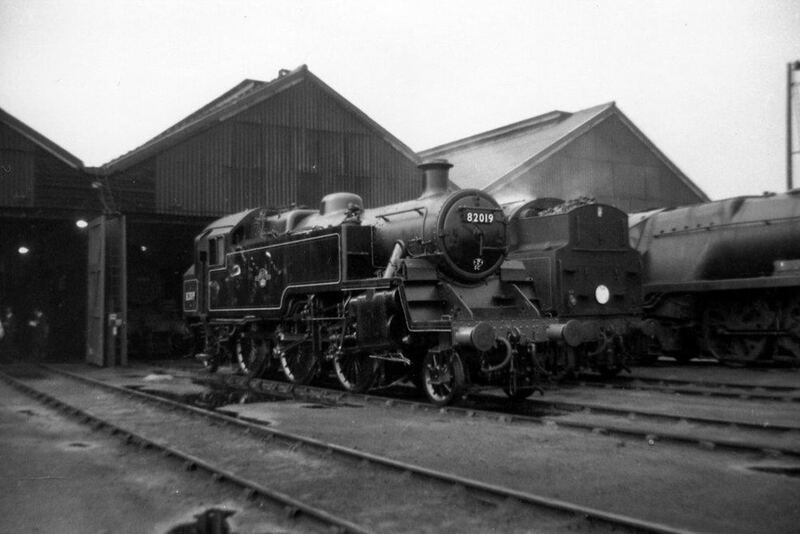 A duet of BR Class 2 2‑6‑0’s Nos. 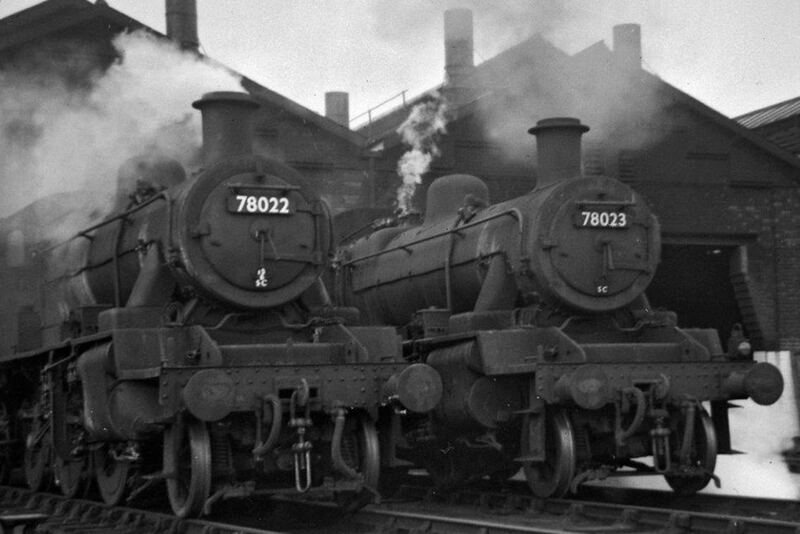 78022 and 78023 stand side by side in steam at Millhouses Motive Power Depot on the outskirts of Sheffield – date unknown. 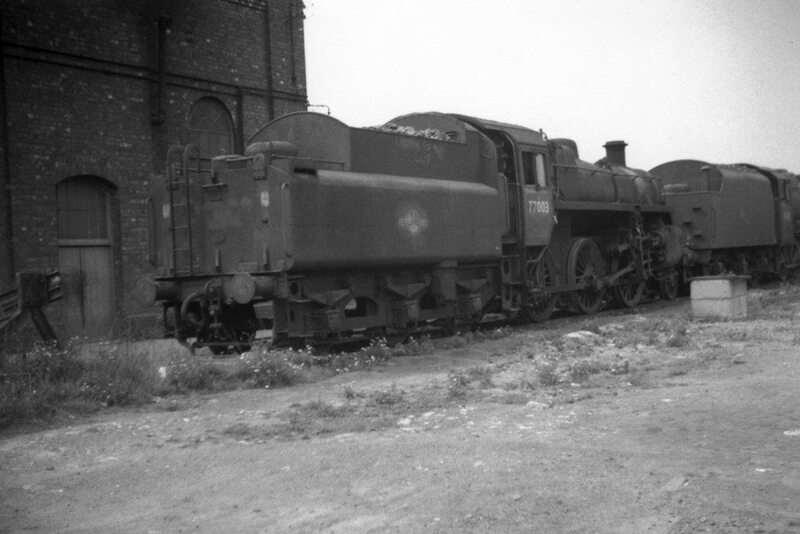 After the depot closed at the end of 1961 both locomotives were transferred to 36A Doncaster. The footplate crew of BR Class 4 2‑6‑4T No. 80072, 2L Leamington, look towards the camera at Earlswood Lakes station on 8th May 1965. No. 80072 has just banked a freight (middle distance) from Stratford‑upon‑Avon and is waiting to return to the same light engine. Having just been overhauled at the nearby Works, BR Class 3 2‑6‑2T No. 82019, allocated to 70A Nine Elms, poses for the camera outside the running shed at 70D Eastleigh on 24th May 1964. Keeping No. 82019 company is BR Class 4 2‑6‑4T No. 80150 and SR Rebuilt West Country Class 4‑6‑2 No. 34028 Eddystone. There are no known additional amendments and queries appertaining to the disposals of the BR Class 3 2‑6‑0’s, Class 2 2‑6‑0’s, Class 4 2‑6‑4T’s, Class 3 2‑6‑2T’s & Class 2 2‑6‑2T’s, but any information to the contrary will be welcomed along with any confirmations or otherwise of the verifications required. Author’s Note: Discrepancies between the monthly withdrawal dates as published in the 1981 edition of WHTS Volume Twenty One and the updated versions online are negligible. Note; Draper’s, Hull: Up until the week beginning 20.11.67 locomotives were cut up in Sculcoates yard. After this date cutting was carried out in new premises in Neptune Street.